Get affordable Security Camera Installation on Encino, CA and CCTV equipment with commercial quality and 2 years warranty. The security cameras can be viewed from almost any location that has a computer with internet connection or smart phone. This allows people to keep an eye on their business or home when they are away. Protection4less security camera system can notify you through email when movement has been detected, with this is easy to detect intrusions on your home or business. All our cameras security cameras are equipped with motion sensors. Even the smallest movement can trigger these motion sensors to start the video recording process. With this feature is really easy to find events on the recording. At this time the security cameras comes in different shapes and they are much smaller that use to be a few years ago. The HD-DVR is capable of recording video for a long period of time, depending of the sizes of the hard disk. The images and videos they record can be saved and edited in a computer. 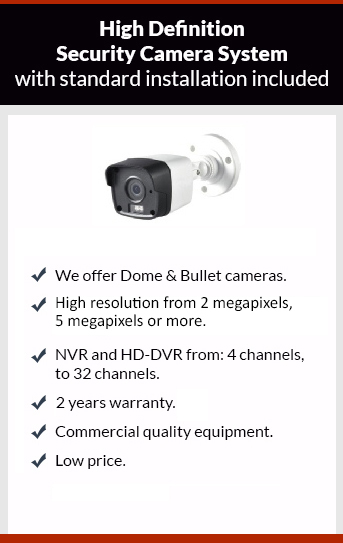 Protection4less has the best security camera solution for you at the best price. Give us a call to get your appointment to get your free estimate.